“All of my past experiences … selling, designing, remodeling, is what I do today.... it’s a coming together of many years of using your own hands," says Pervaiz Lodhie, shown at his company's office in Torrance. He displays an LED light used at the Vincent Thomas Bridge in San Pedro. The CEO of LEDtronics, a maker of light-emitting-diode bulbs, got his start as a 10-year-old selling yo-yos to classmates in Pakistan. 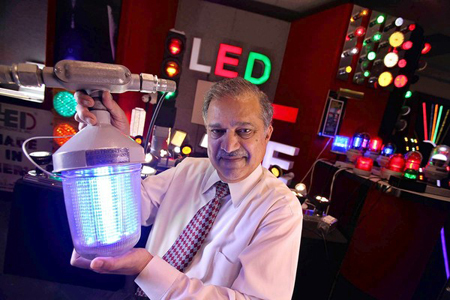 The gig: Pervaiz Lodhie, 66, is the founder and chief executive of LEDtronics, a manufacturer of LED (light-emitting diode) bulbs. LEDs burn cooler, use significantly less energy and last tens of thousands of hours longer than traditional incandescents. Lodhies LEDs can be found in spacecraft, robots, traffic lights and other products in which reliability is crucial. His clients include Northrop Grumman Corp., IBM Corp. and Caterpillar Inc. More than 300 employees work at the privately held firm, which is headquartered in Torrance and has an additional plant in Pakistan. Shining bright: LEDtronics bulbs can be found illuminating chandeliers in Buckingham Palace, lighting the set of the musical "Wicked" and in a variety of other locations including the Smithsonian Institution, the Mandalay Bay Hotel in Las Vegas, the Standard hotel in Hollywood and the Vincent Thomas Bridge in San Pedro. Entrepreneurial spark: Growing up in a middle-class family in Karachi, Pakistan, Lodhie and his six siblings enjoyed a comfortable childhood. But his parents pushed the kids to be resourceful. "They said when you need pocket money, you need to make it yourself," Lodhie said. At the age of 10, Lodhie spotted an opportunity on the playground: yo-yos and spinning tops. The youngster contracted with some local artisans to make the toys, which he resold to classmates for a profit. As a teenager, Lodhie designed aquariums and remodeled bicycles. "All of my past experiences … selling, designing, remodeling, is what I do today.... it's a coming together of many years of using your own hands." The light goes on: After coming to the U.S. and graduating in 1972 with a mechanical engineering degree from Cal State L.A., Lodhie went to work at a company that specialized in making electronic products. The young engineer was struck by how much energy was used by incandescent bulbs he worked on and by how frequently they burned out. He decided to start his own business: "For me it didn't matter if it was developing yo-yos or lights; they're both electromechanical products made to solve a particular customer's needs." Out of the shadows: Lodhie started tinkering in his home garage, developing an LED version of a bulb so small that it's called the "grain of wheat." That tiny product ended up lighting switches in military aircraft. Orders multiplied. Lodhie soon outgrew the garage. Getting connected: Lodhie's stature has grown as well. He advised Rep. Jane Harman (D-Venice) on her draft of federal legislation mandating greater energy efficiency for light bulbs, and he serves on her Jobs Task Force, which is working to create clean-technology jobs in the state. Lodhie is also active in the Pakistani American Business Executives Assn. Though ties between Pakistan and the U.S. have been strained since 9/11, Lodhie said his business hasn't been affected. "I consider myself first as an American and feel very proud of my role as one of its best citizens," he said. Giving back: Lodhie never forgot his roots or the peasant craftsmen who helped him get his start selling yo-yos. So he's helping bring electricity and efficient lighting to villages in rural Pakistan to boost economic development. He said villagers can now make more handicrafts and venture out in the evening. "They're no longer afraid of the snakes and scorpions that are problems in the area, and each light placed is affecting approximately 10 people." Piece of advice: Lodhie says many young entrepreneurs give up too soon, wanting to taste the fruits of success immediately. "It usually takes a very disciplined couple of years of effort," he said. Reinvesting in the businesses is crucial, he said. The fancy cars and big office can wait. Personal: Lodhie lives in Rolling Hills with his wife, Almas, and their three children, Kiran, Shaan and Kaval. In his free time he plays table tennis, cheers for the Lakers and listens to the Beatles, Stevie Wonder, Al Green and various Indian artists on his iPod. Striving for balance: Lodhie says hard work shouldn't be a substitute for a fulfilling personal life. He and his wife agreed early on that "the business will be for the family, and not the family for the business." He knocks off at about 4:30 every afternoon. After that, he said, his priority is his loved ones, and "it doesn't matter who wants me or not.... I'm not one of those people that said I wished I could spend time with my kids when they were growing up."